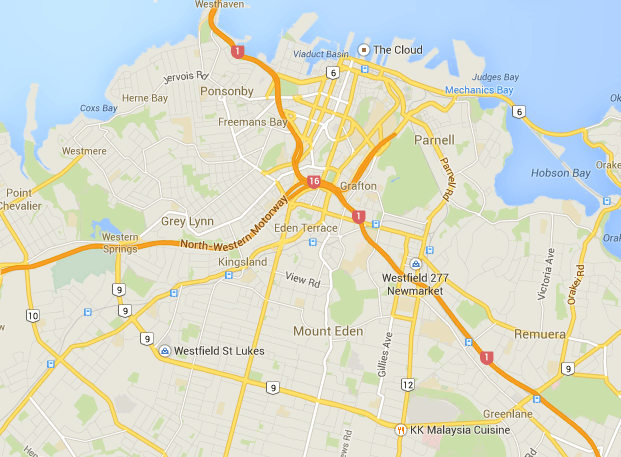 What do you get for $250k, $500k, $750k or $1m in Auckland? A little context first, perhaps. Our CBD is more a place for work/leisure rather than living. There are apartments in town, but in many cases they’re cheap and nasty shoeboxes, with some nice luxury ones at the other end of the spectrum and not much in between. While the Auckland real estate market has soared, apartments have not appreciated in the same way. (Banks have relaxed the rules in the past couple of years but generally you needed a 30-50% deposit when buying an apartment. )To get an idea of how our housing market has grown, there’s a great interactive chart over at The Economist – aside from the craziness that is Hong Kong, NZ is basically on par with Australia and Britain. The most sought-after places to live are the areas immediately surrounding the CBD. Years ago these were worker bee neighbourhoods, with houses packed up close against each other in narrow streets. A generation on these villas are now the domain of the wealthy and go for seven figures – gentrification! Woot! Outside of the CBD, standalone houses remain the norm here. You’ll find the odd apartment block or terraced house complex here and there, but in many cases they’re hideous and poorly built. ‘Leaky home’ syndrome also affects a lot of the new standalone homes built in the 1990s/2000s boom. Finally, very few properties actually get listed with an asking price (as you’ll notice on a few of these links) and most are sold at auction. There’s a lot of guesswork involved if you’re buying a place in Auckland, and council valuations are more often than not just a starting indication – places sell for well over those prices. Auckland is pretty sprawling, but I’ll be focusing here on the inner city suburbs surrounding the CBD, as well as the CBD itself – roughly within the Outer City Link bus route. This provides a better reflection of the areas where people most want to live. (We don’t really delineate between ‘neighbourhood’ and ‘suburb’ here, certainly not as clearly as some of you might be used to.) According to Google Maps, this area is within about 10km of the CBD. In the CBD, you’ll get a 1, maybe 2 bedroom apartment. The nicer ones might be 50 sq m with one bedroom; the more cramped ones 40 sq m with 2 bedrooms. (There is a listing – that I will not dignify with a link – for a 3 bedroom apartment crammed into less than 50 sq m … that’s half of what a 3 bedroom dwelling should cover.) A carpark is a maybe at this price. Here is a reasonably typical example. You might find the odd apartment in the fringe suburbs – there aren’t many of those (less than 10 at this very moment, one with ‘weathertightness’ issues). At this price point they’d be 1 bedroom. This would get you a somewhat decent apartment, with carpark even, in the CBD or surrounds. Like this. In the inner suburbs $500k will barely stretch to a small , 1-2 bedroom unit in a block. These most often come in rows of 4. Here’s a typical example, as pictured above. In the CBD, you get a pretty nice, roomy apartment. Maybe this one? In the inner suburbs, this is still entry-level territory. You’ll get nothing special; houses in this bracket might even still be do-ups that need work. Example here. There are about five CBD apartments listed in this price bracket (but yes, they are lovely). In the inner suburbs, it’ll get you a classic 3 bedroom bungalow or villa (here’s a do-up, and here’s a renovated one), or a newer build house. Or a condemned hovel on some prime land. Alas, while renting might be cheaper, it might literally kill you. The standard of rental housing here is ridiculously low. See my most recent rants here, here and here. Those prices hurt my head. I love Auckland but I could never live there if that’s what it costs to own a flat! We moved back to Christchurch from Sydney just so we could own our own house. Sydney prices were exactly like Auckland, needing two full time incomes to live a decent life and pay the mortgage – ouch. We got a 3 bed with big section close to the city for less than the first apartment, but of course in Christchurch we earn so much less. I really feel for you – would you consider buying elsewhere and renting it out just to have a foot in the market? Nice article, you really live in a beautiful place. I’d love to visit New Zealand someday, and Auckland is definitely tops on the list. I don’t like the blue trim on the $750k house, but it’s got a great interior. I think I’d aim for that one if I was in the market. Real estate prices are something that has always fascinated me. It’s amazing (and sometimes shocking) to see what a certain amount can buy you in different cities. $250K may get you a zero bedroom loft in one part of the world, or a 5 bedroom brand-new build in another. Your city seems lovely, but those prices…ouch. It’s been interesting seeing the costs of real estate from various blogging around the world. Maybe a Nashville post is due. Gosh I just LOVE this series! Did y’all just plan this at FinCon or what? I live in probably one of the top 5 most expensive housing markets in the US and, while not quite as expensive as NYC or SF, it is pretty damn pricey. I’ve been mostly just looking for 2-beds in my area and it’s nigh near impossible to find a place under 400k in the inner suburb I live in. 3-bed condos are around 600k and houses… don’t even get me started on those! Stefanie at the Broke and Beautiful life inspired me to write a similar post on real estate costs in Indiana. I am working on it! It really is crazy to see what real estate costs around the U.S. and the rest of the world. The differences are huge!